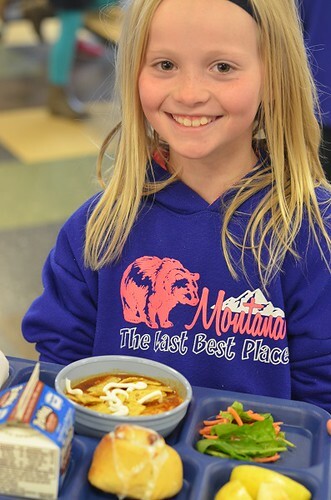 A student from Monforton Elementary in Bozeman, Mont., enjoys a school lunch made with Montana beef, lentils, whole wheat flour and local milk. What’s new with school lunch this year? In several school districts across the nation, this question is being answered by students themselves. Collaborations between school staff and students have resulted in school cafeterias that provide a welcoming environment for eating together, while offering healthy, appealing choices for their students. With the help of Team Nutrition Training Grant funds, many states have created these changes and developed ways to include kids in menu planning, taste tests, cafeteria makeovers and more. For instance, in Michigan, students are in charge of designing the menu board each day, helping to creatively show the food options available for lunch. This in turn helps speed up time spent in the lunch line—so everyone wins! They also engage students in school garden activities and taste tests. Check out their great video: https://www.youtube.com/watch?v=jiZdrbMfDNY. In Montana, student advisory councils helped add preferred items like soup and homemade bread to salad bars, even adding attractive signage to engage their fellow high school classmates. Students are also exploring Montana’s delicious agriculture through taste tests, classroom activities and meals and snacks provided by the school or afterschool program. By participating in the Montana Harvest of the Month Program, students have the opportunity to enjoy recipes made with local foods such as winter squash pancakes, Montana beef burgers and kale chips. In Iowa, students work with school staff to make the way fruits and vegetables are displayed in the lunch line more appealing. They’ve also added healthy smoothies to the menu. According to staff and students, one of the biggest benefits of these collaborations has been the process of working together. Staff learn more about the types of foods kids want and how they want them. While students learn more about nutrition and the thought and planning that goes into school meals. USDA recently announced the award of the 2017 Team Nutrition Training Grants to 11 states. These funds will help states like Wisconsin, which will provide nutrition education to students through culinary demonstrations, taste testing activities and a student chef competition. And Kansas, who plans to include more than 28,000 students in nutrition education opportunities and engage students in leadership roles to develop and put into place school wellness policies. See summaries of their projects and the rest of the grantees on the Team Nutrition website. What school lunch looks like can be very different depending on where you are in the country. While all school lunches have to meet the same basic nutrition standards, the National School Lunch Program also allows for a lot of local flexibility. This makes it possible for schools to adjust their menus based on input from students and their families. Interested in getting involved and learning more about meals at your local school? Reach out to your school nutrition director or join your school wellness committee, participate in taste tests and surveys or just look for great ideas from other schools.